To create a new disclaimer login to the MSPControl and click on Disclaimers or go to Organizations > Exchange > Disclaimers. 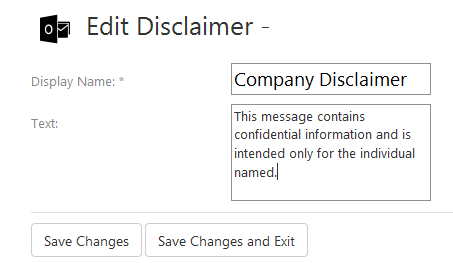 Give your disclaimer a name and type in the disclaimer text. Next, if you're done with this particular disclaimer, click Save Changes and Exit. This will save your disclaimer and redirect you to the list of all existing disclaimers. Save Changes button also saves your disclaimer, but leaves you on the same page where you can edit your new disclaimer.